Hello, everybody, and Happy Thanksgiving! I’m Amy from Modern Chemistry at Home, and I am so honored to be here at House of Turquoise. My heart for my blog is to encourage and inspire you to work on bringing beauty and creativity into your home with an eye on the budget. I share DIYs and ideas, but I also talk about contentment and using our homes to bless other people. 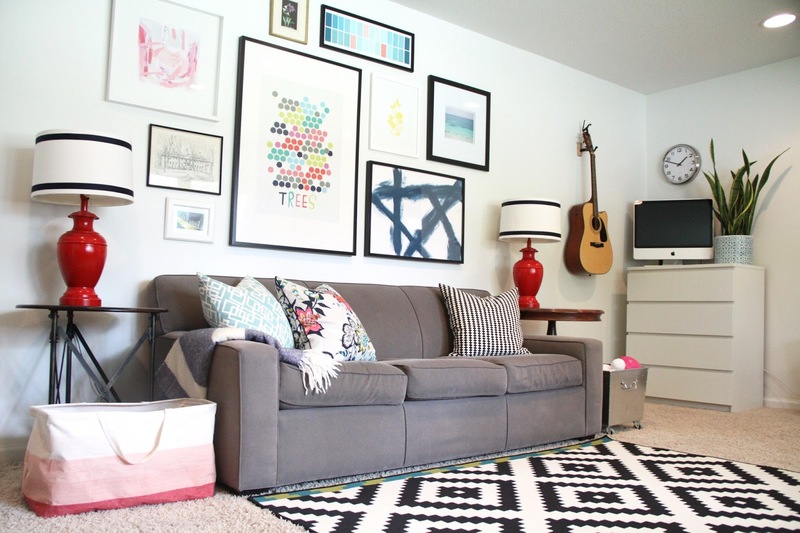 I hope today’s post gives you lots of ideas for your spaces! When I was young, my parents gave me permission to choose paint colors for my bedroom and you better believe I painted one wall bright turquoise. Turquoise, teal, aqua . 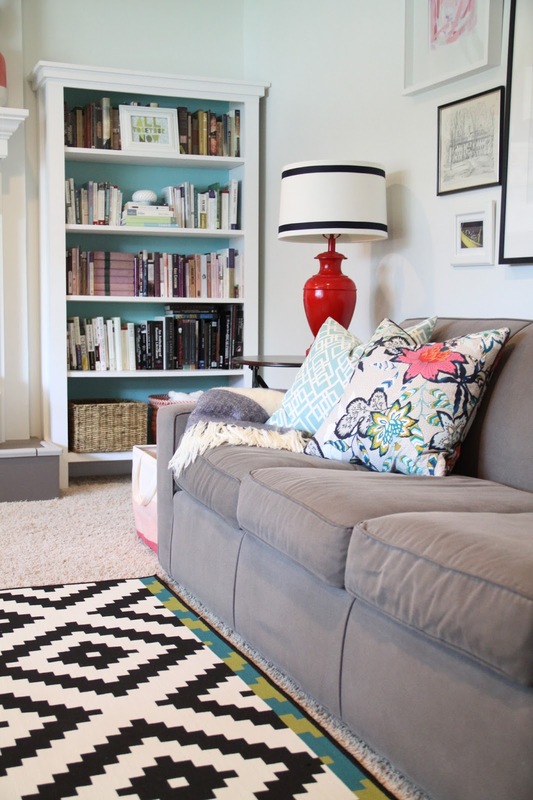 . . these are such fresh, cheerful colors that still find their way into almost all my spaces. I just can’t seem to get enough! So come on in and I’ll show you around. If you walked into our home, I’d grab your coat and usher you right into the kitchen. This is where a lot of life happens for us. 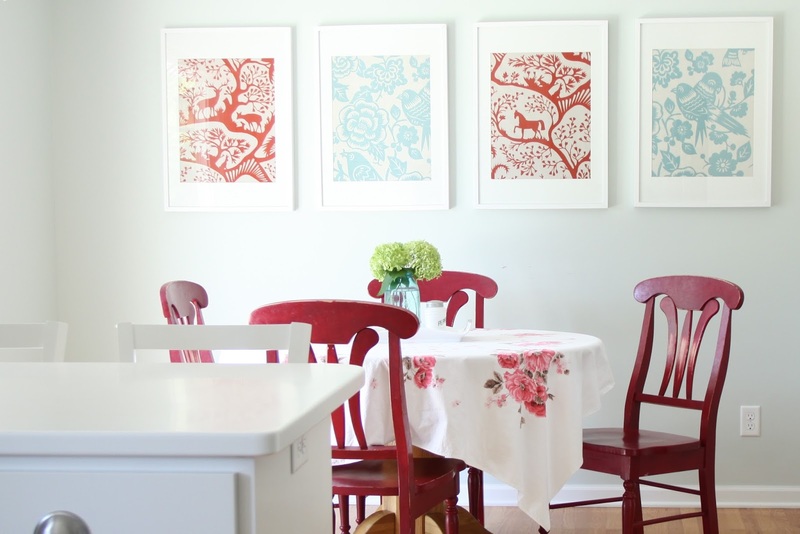 Getting the kitchen “right” was a long process, but this room has become one of the most cheerful places in our home. First, we tore down an adjoining porch that was quite dilapidated and we expanded the windows and doors. The result is that sunlight now pours into the space! 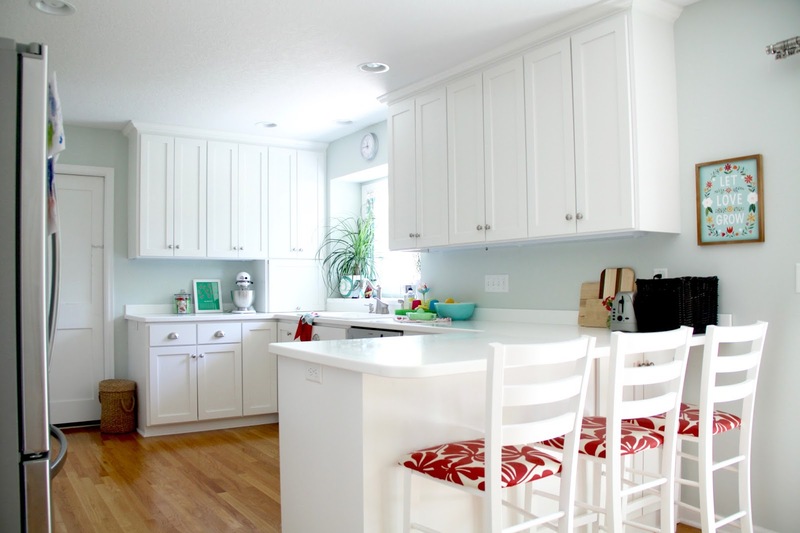 A full kitchen remodel and pale blue/green walls make our kitchen so very bright and happy. 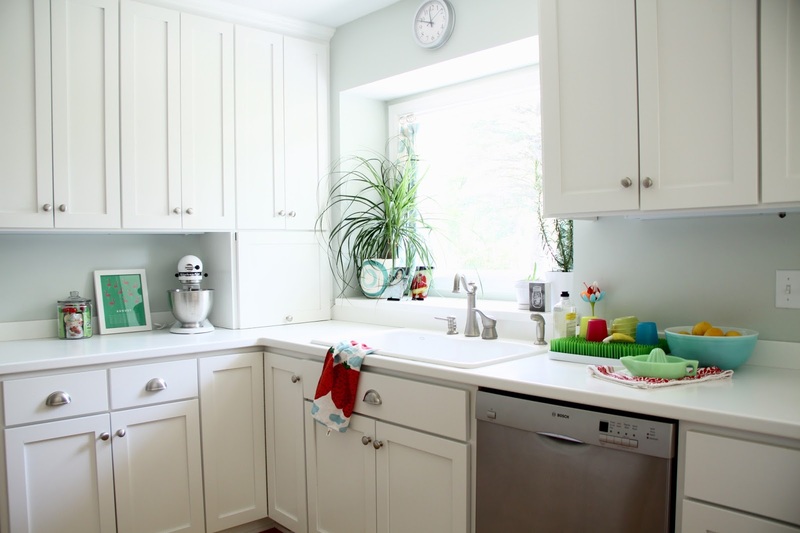 I stay at home with our two girls, and being in this kitchen throughout the day is a joyous thing with all that light—especially during dark Minnesota winters! This room is also where I learned firsthand that aqua loves red. When I needed art to fill the large wall in the dining nook, I framed pieces of large-scale fabric and I am so thrilled with the result. The combination of aqua and red has a preppy freshness to it that speaks my color love language. Aqua and red are now best buddies and appear together throughout our home! The other thing I learned in the kitchen is that tone-on-tone really works. The kitchen walls were previously dark brown, but I wanted to lighten things up. 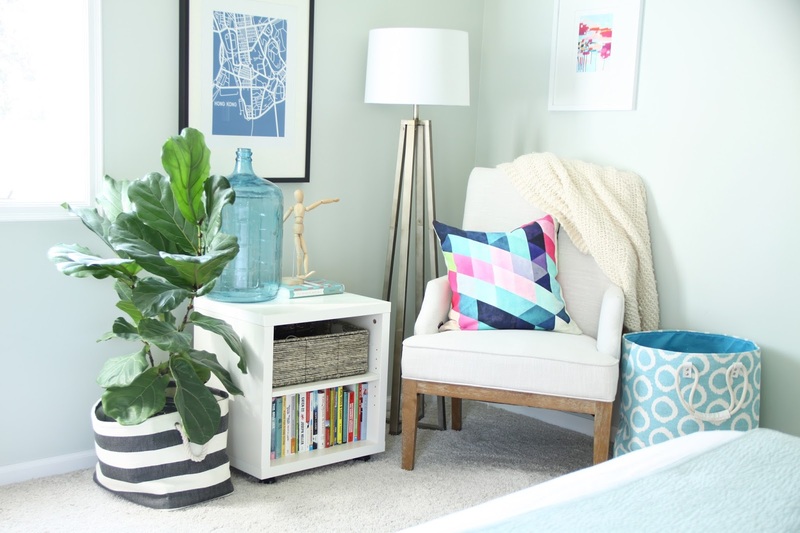 I already had aqua in the curtains and wall art, so I wasn’t sure how those items would work in the space if I painted the walls pale blue. But you know what? The existing aqua items pop off the pale blue background so beautifully. So the lesson here is don’t be afraid to use varying tones of the same base color in your rooms. 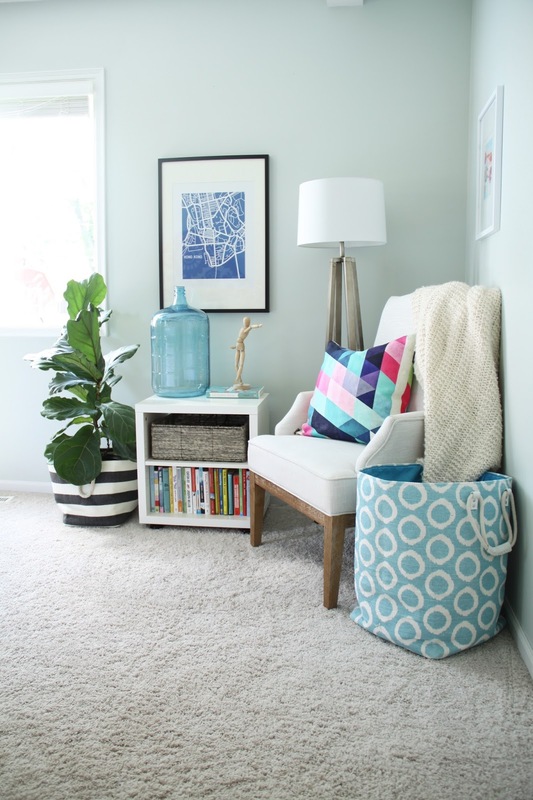 As we see on Erin’s blog, variations of turquoise really do live happily together! 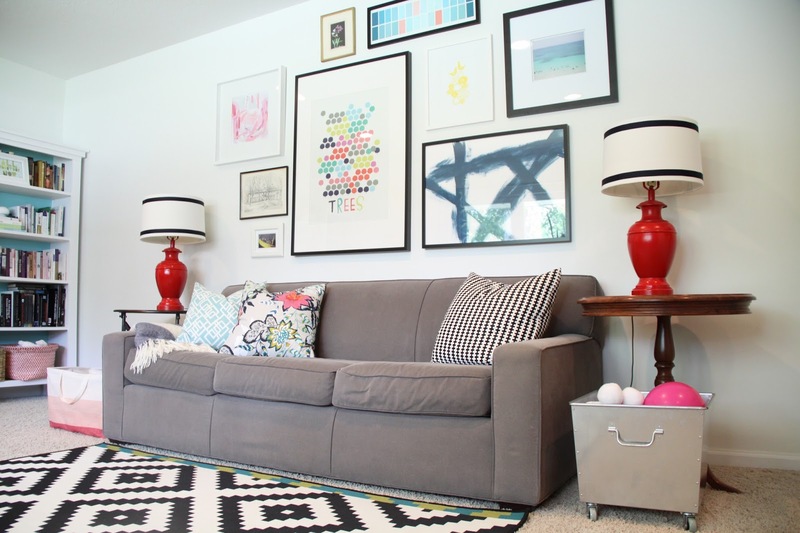 There has been a lot of trial and error in the living room—mostly in the form of furniture arrangements! Painting the walls white helped move this room in the right direction, and then the rest kind of fell into place. In this room, my beloved blues take a bit of a backseat to a fuller color palette, but they are still here. 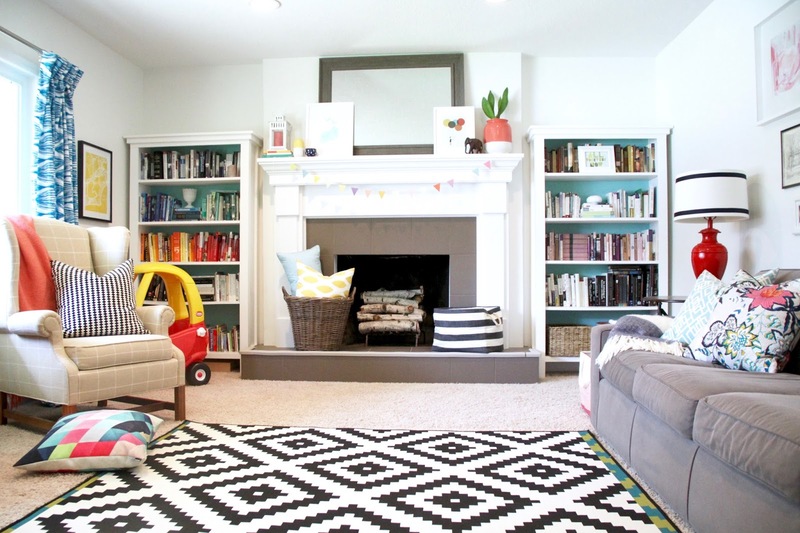 One of the first projects I completed in this room was to help build a set of custom bookshelves. Before I installed the backboards, I painted them bright turquoise! 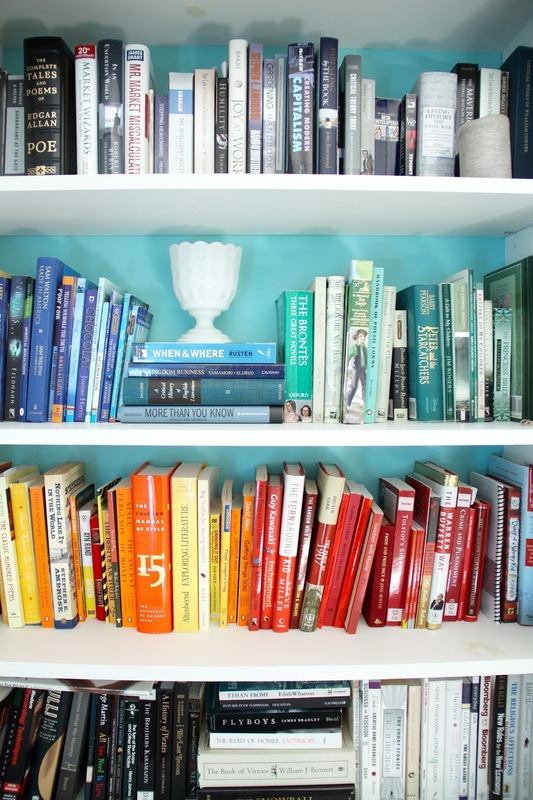 I also arranged my books by color for a big visual wow. And I took my color cues from my books, which means that pretty much any bright color works in this room. 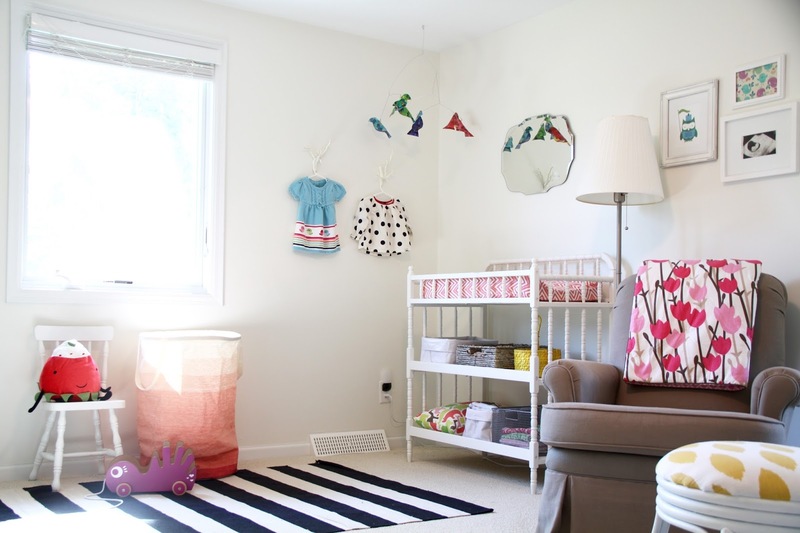 This room functions as a playroom for us and incorporates many of our children’s toys. 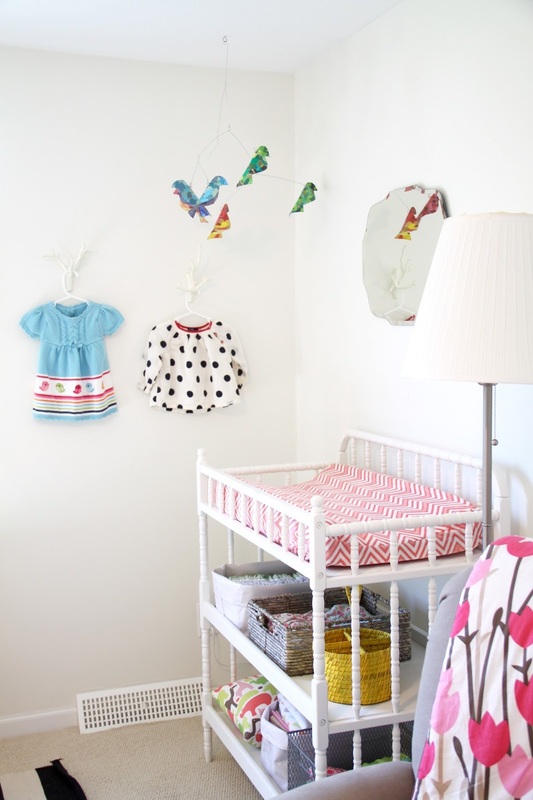 As you all know, kids’ stuff is often brightly colored! So as a foil to all that brightness, I brought in some bold black-and-white stripes and geometric patterns to match the playful mood but not compete with it. There surely is a lot of pattern and color in here, but I am so thrilled whenever I hear a guest call our home “cheerful.” That is exactly what I hope it would feel like for everyone who enters these doors. But teal does take center stage in our pinch-pleat curtains, which I made from duvet covers. 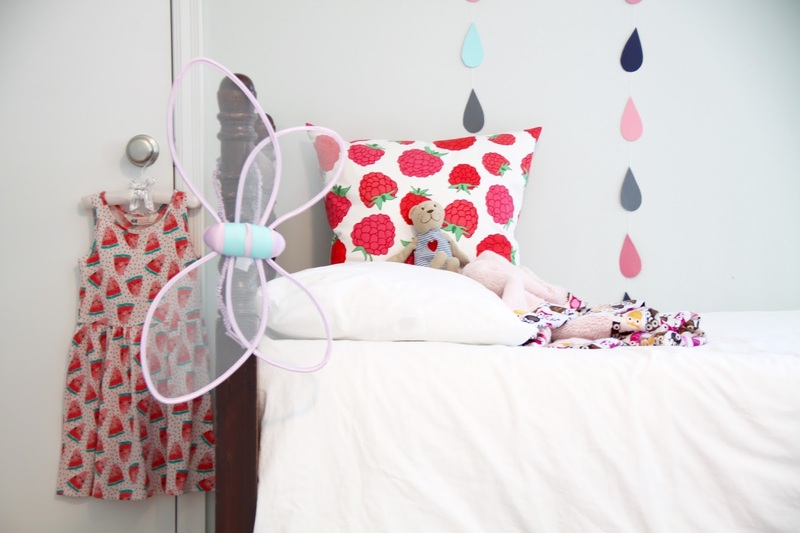 Curtains, especially large curtains, can be so expensive, so I was thrilled to find a way to make my own on the cheap. In our bedroom, we are back to aqua and red! I made this headboard following instructions from Design*Sponge and using fabric from Calico Corners. 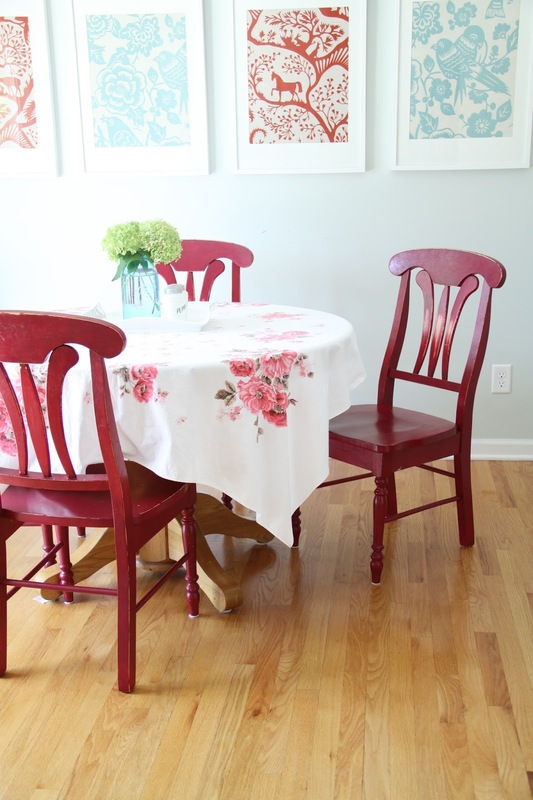 (The fabric designer also designed the fabric I framed in the kitchen. His name is Thomas Paul and his designs are just so happy.) After an unsuccessful try at gray walls, I repainted this room the same color as our kitchen. 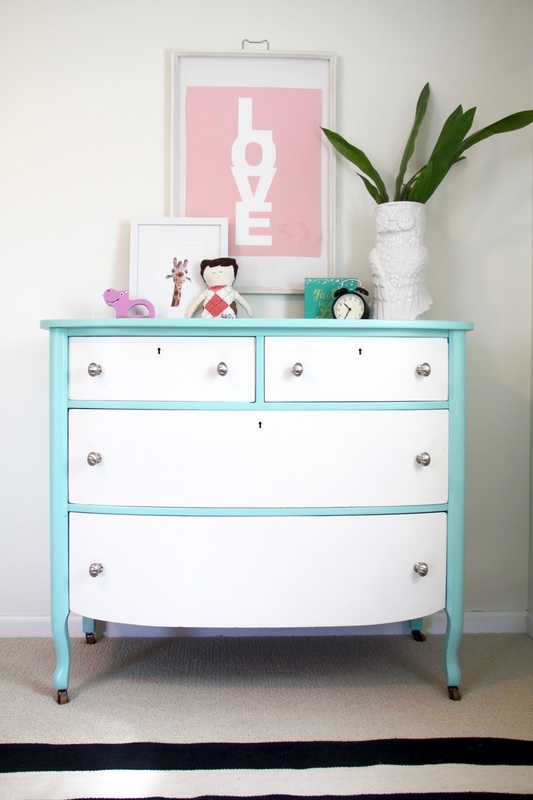 I just love the color because it looks fantastic with white, wood, and bright colors. The dresser belonged to my grandparents and is very special to me. The wood is a gorgeous color and those knobs are just lovely. 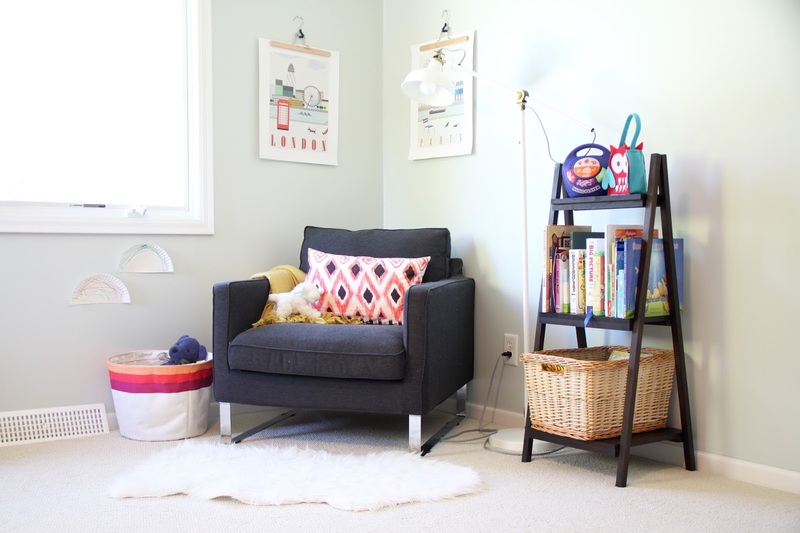 In the other corner, we put together a little reading spot for my husband, who often works from home in the evenings. 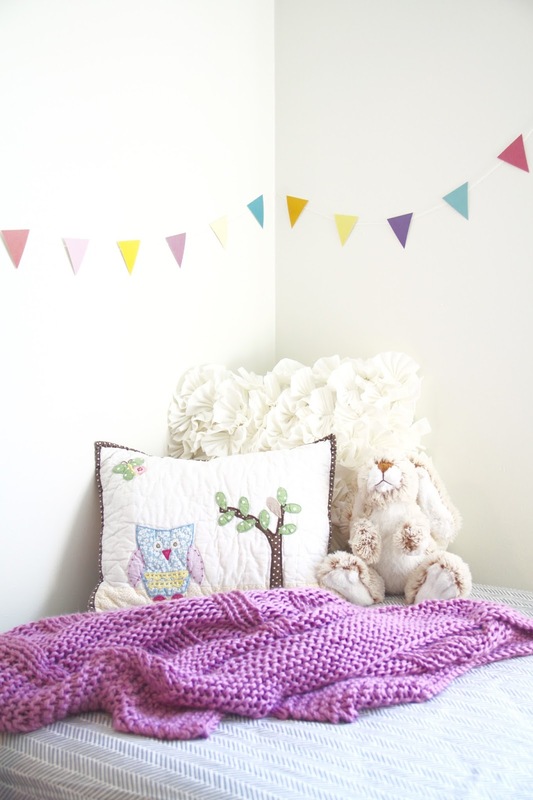 A bright pillow, fun art, and a throw my mom knit complete that cozy yet bright corner. One of the design concepts I love in this room is that color can be simultaneously energizing and relaxing, and I think the key to that is to mix pale tones with brightness. If the walls were a brighter, deeper turquoise, it might be a bit too much. 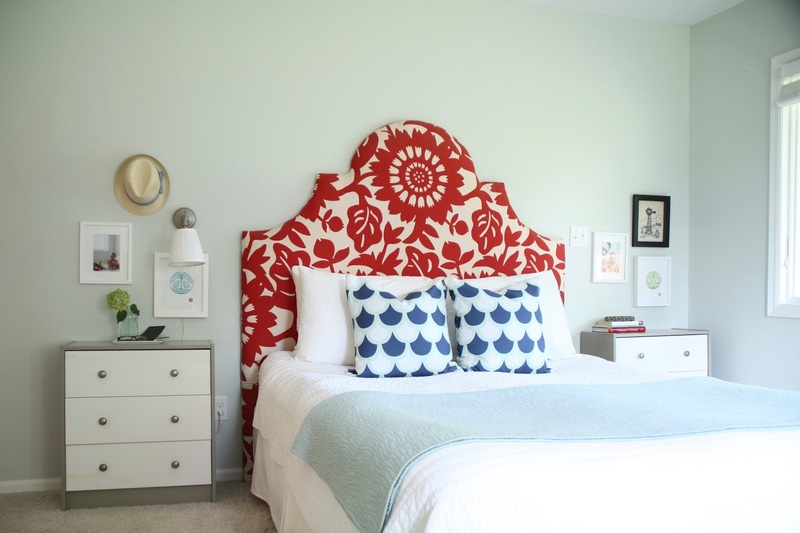 But with all that bold, energetic red on the headboard, the pale blue walls and even the throw on the bed bring in a bit of cool serenity to take the vibrancy back a notch. 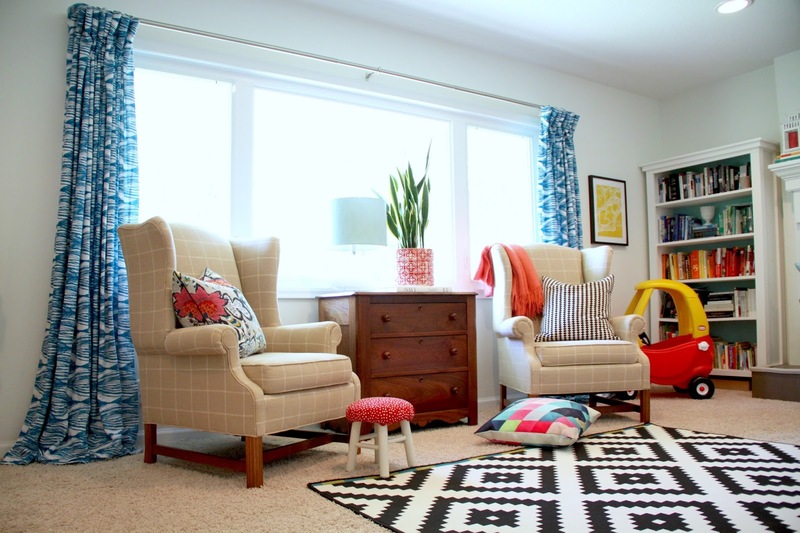 Children’s spaces are such a fantastic opportunity for color! I find myself increasingly inspired by Scandinavian design, and this was the first room in our home where I tried white walls. I really like the result! The colors in here pop off that backdrop as this room is flooded with morning and afternoon light. We have two girls and I myself really love pink. Pink and aqua is another very nice color combination! 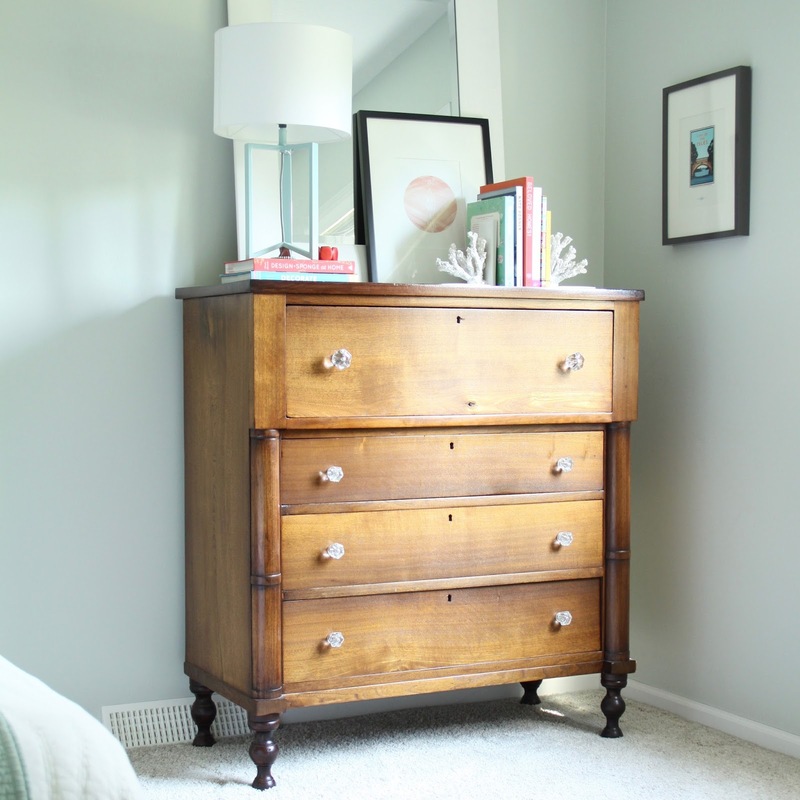 This dresser was a hand-me-down within our family, and it was needing some love. I debated over what color to paint it, but I ended up reusing the turquoise from the back of the living room bookshelves with a little white mixed in. And I’m really happy I stuck with white drawer fronts. I think the two colors make the piece look just a little more interesting than if it had been just one color! 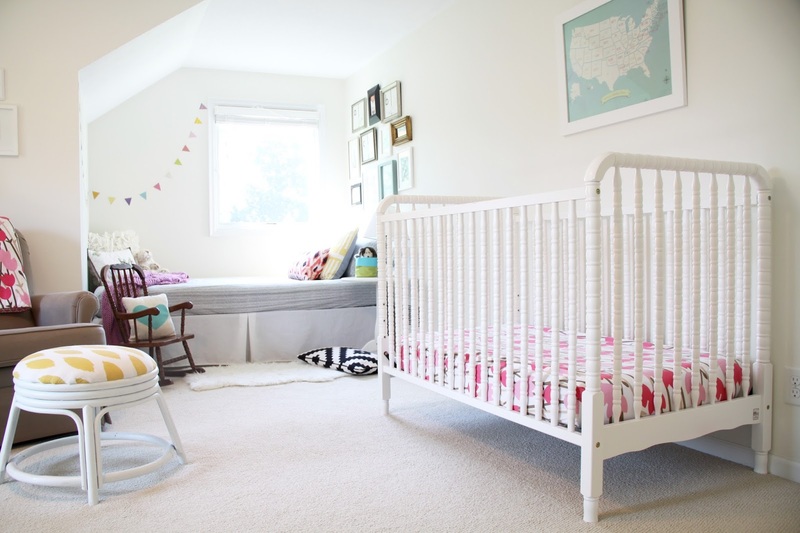 Our older daughter’s room is bright and fresh like the nursery, but in this room we have pale blue walls. 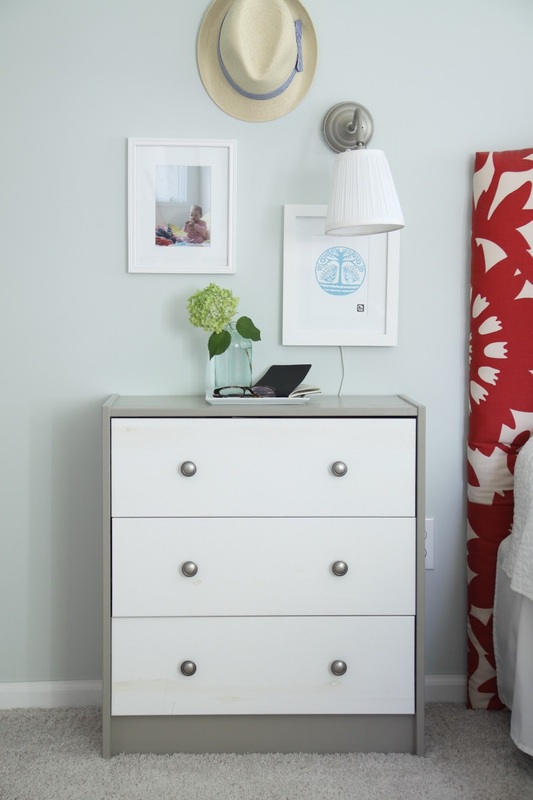 It is the same color as the kitchen and master bedroom: Healing Aloe by Benjamin Moore. It is such a winner. Thank you for having me, Erin! It is always fun to write about color. 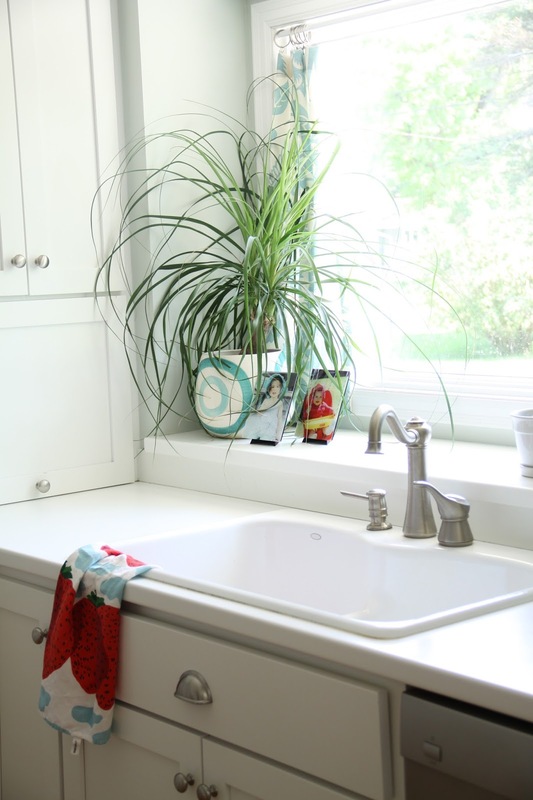 Please do pop over to my blog for more home design encouragement and inspiration! I even wrote a guide to help my readers work through the tricky spots in their homes. Come check it out! And Happy Thanksgiving, everyone! 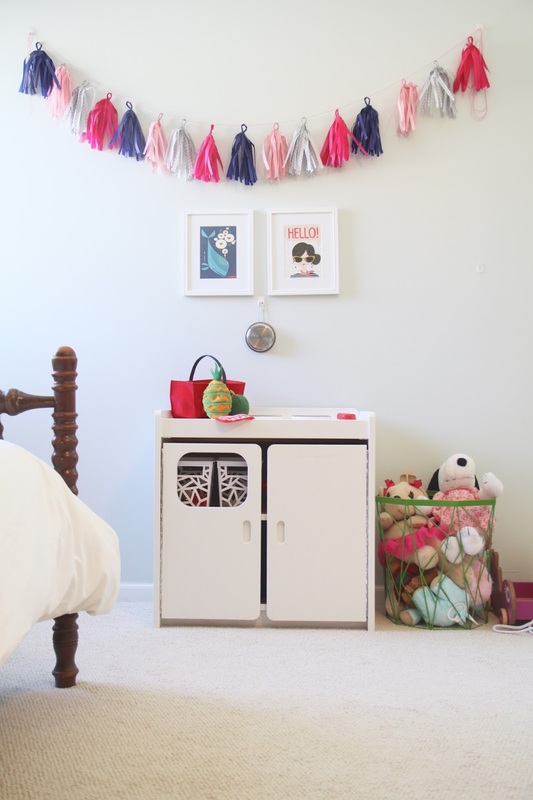 Fun and Cheerful Readers’ Rooms! I loved this post! You have a charming house and I loved all of your discussion about paint color and decorating decisions – I have taken note of your recommendation of the BM blue paint color for future reference! Thank you for this. From Margie in Toronto – What a lovely home you have! Just love your colour combinations. I have bookmarked your blog and will visit soon.